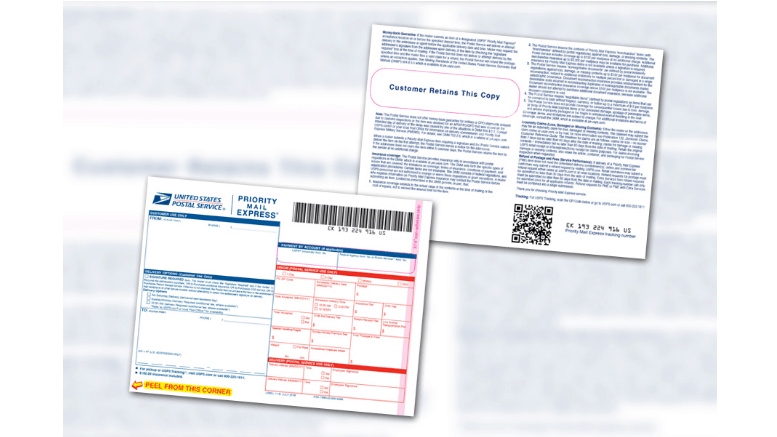 July 31, 2018 — The Postal Service has redesigned the Priority Mail Express label to ensure delivery accuracy. The new, single-ply label 11-B/11-F was introduced in July. It replaces the current, three-ply Priority Mail Express label 11-B/11-F. The redesigned label is expected to eliminate delivery challenges that result when the bottom copy is illegible because senders fail to press firmly when completing the label. Additionally, the new label has a Quick Response (QR) code on the back that customers can scan to track their Priority Mail Express items. Post Offices are encouraged to deplete their supply of the existing version of the label before beginning to use the new, redesigned label. Employees who have questions should send an email to ShippingServices@usps.gov.